Remember, I warned you to get ready for lots of Christmas talk around here! Here goes the first installment! I haven't really made a habit of seeking out Christmas titles to read until just last year. I read Christmas at Fairacre (click on the title to read my review) and totally loved it. Of course, I've read Christmas With Anne (Christmas stories written by my favorite author, L.M. Montgomery!? Hello!) and A Christmas Carol by Dickens. But this year I thought it would be fun to read a cozy Christmas title. 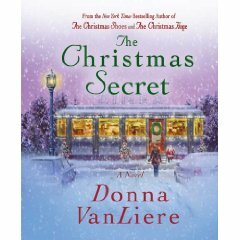 Therefore when I was offered a chance to read The Christmas Secret , by Donna VanLiere, I said, "please!" Oh, am I ever thankful! I've never heard of Donna VanLiere before, although I had heard of the book title The Christmas Shoes . Apparently, VanLiere has a "Christmas Hope" series and The Christmas Secret is book 5 in the lineup. I'm glad to know that there are four others because I'll be making a point to read each and every one of them! Was this book good!? Oh my stars, yes! This is the PERFECT Christmas book and was exactly what I was looking for. It is well written, believable, (I can visualize it as a chick flick), made me cry at the very end, and was a grab-your-latte-and-Kleenex-and-try-to-find-a-quiet-spot-alone-some-place type of read. This book is the epitome of relaxed down time and Christmas bliss. VanLiere has a very clever writing style. She intertwines so many lives within this book and the story slowly unfolds revealing more about the characters, exposing some relationships and building others. In The Christmas Secret we meet Christine Eisely who is a single mother of two children who is down on her luck in so many ways. Her ex-husband is hammering down her door to see the kids, and yet refusing to pay child support. She loses her job and is about to be kicked out of her duplex when life suddenly takes a turn for the better. Although that storyline might surprise you as being one I would normally enjoy, VanLiere manages to take this deep and head-y subject matter and handles it tastefully, sometimes humorously, and always in a hopeful manner that just draws the reader in and involves them in all the nitty gritty details. Fabulous, fabulous story telling abilities. VanLiere tells a clean story in a way that just delights the reader, making them feel those warm Christmas fuzzies that we're all after this time of year. I really couldn't speak more highly of this book. This post was originally a giveaway but the contest is now closed. This does sound good. We don't have cable or satellite either, but I will admit that watching Christmas movies is one thing I miss. We just got cable, well, satellite, and I set them to record! Thanks for the heads up! But you might want to change the date to 12/13 in your post. I think you should move in next door to me so we can be buddies in real life. Thanks for sharing the Christmas secret.It looks great. Will buy my copy soon. I just picked up this book from the library. I have enjoyed her other Christmas books. I highly recommend her book, Angels on Morgan Hill, a non-Christmas book but a great story. I've seen "The Christmas Shoes" and loved it. I've added "The Christmas Secret" to my Christmas TBR list as well as the others you mentioned. I'm looking forward to reading it. A wow giveaway, I love Christmas books. Sounds like a lovely read! I'm looking for a nice holiday book for the season. Oh, you know I love a good sappy holiday book or movie! Sounds interesting! I'd love to win and try out this author. sounds like a great book to curl up with. And i know i'm not sposed to end a sentence with a preposition. i'd love to win sometime! Sounds delightful! Please enter me! This sounds lovely; count me in! I'm interested! It sounds like a really good book. I would LOVE to read this book...thanks for the opportunity. Sounds good. I've yet to read a Christmas story this year...or even last, I think. Thank you for a review of this book. I would also love to have a copy! I've seen the Christmas Shoes and loved it...and of course cried! =) I look forward to seeing the other ones! Thanks for the chance to win this book...looks great! This looks like a wonderful book! Count me in. Great Giveaway- charming books! I have enjoyed her first Christmas stories...thanks for the giveaway! Sounds like a nice read for a cold blustery evening! Please enter me! I would love to get a copy of this book! We are all about Christmas stories in this house. I have a collection on my coffee table and would love to add a new book to it. One of our traditions is that I read aloud to my kids during the month of December. After 12+ years they'd appreciate a new book too. My book club has decided to substitute our regular meeting to watch the Christmas movie series on Dec. 13th. I love christmas books. Please enter me. I always like to read the book before the movie and like new books. Sounds like a wonderful book, one I would really enjoy reading. Please enter me. Thanks! I love The Christmas Shoes and would enjoy reading this book! Ooh! This looks great! Please enter me! I'd much rather read the book first on a cold winter night!